Last weekend, hubby and I went to Chicago for the weekend to celebrate his birthday. As always, we had a wonderful time and ate as much delicious food as we could pack into one weekend. Aside from the stolen purse fiasco, it was magnificent. The only request I had for the weekend was that I absolutely MUST visit the new Eataly Chicago, so of course, my loving husband obliged and we set off for a little Foodie Field Trip on Saturday afternoon. Along with the rest of Chicago. The weather was fierce, so being in this giant establishment full of Italian treats, authentic ingredients, more places to eat than you can imagine, and lots of fun kitchen gadgets was a more-than-welcome activity for the both of us. It was so crowded in there that I couldn’t really take any good photos, so check out their website to see what all the fuss is about. Upon entering, we made a beeline for the Nutella bar, and I (predictably) ordered a crepe with Nutella. We wandered around for quite a while and marveled at all the wonderful cheeses and fresh meat and fish options. Sadly, as two travelers in town via train without any way to get fresh ingredients home safely, we were limited to purchasing what we could eat immediately. We enjoyed a couple panini, and I did my best with reading the Italian on the various signs. All in all, a great experience. I would love to go back when it is less busy, and we are more hungry. As with all of our travels, I had to find a great cookbook as my souvenir, and I did. Since Eataly was created by Mario Batali, Lidia Bastianich,and Joe Bastianich, I thought I would choose one of their books. However, the Nutella Cookbook was tempting. I ended up going with Molto Italiano by Mario Batali, which also happens to be my first Mario Batali cookbook. So far, I have loved reading through it. Lidia, you’re next on my list. 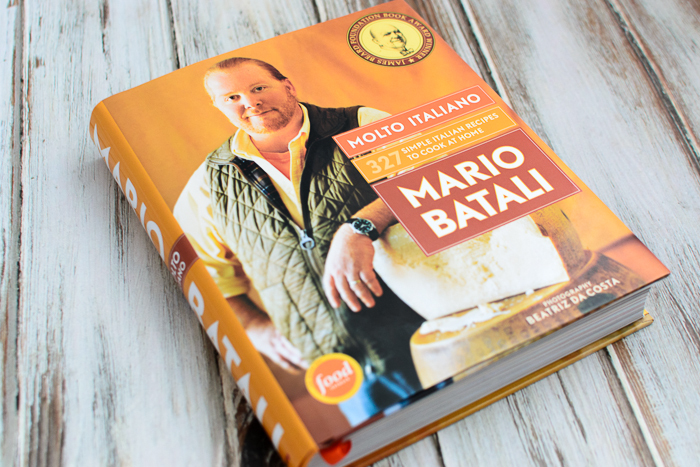 Appropriately, my Cookbook of the Week this week is: Molto Italiano by Mario Batali-327 Simple Italian Recipes To Cook At Home. I am eager to try so many of the recipes that it was difficult to choose only a few. Truthfully, my selections were somewhat limited due to the fact that I live in Michigan and it is the dead of Winter. Let’s be honest, the availability of certain ingredients is almost nonexistent. I shall save the recipes with hard-to-find ingredients for when I am in Italy. Or back at Eataly again.